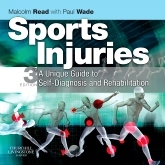 Sports Injuries provides an indispensable self-help guide to all the common injuries that occur. This book will help to quickly pinpoint the source of the injury, know which conditions you can treat yourself and when to visit an expert, stay fit and flexible during recovery, and encourage your body to heal faster. Easy-to-follow illustrations help you to locate the area of pain quickly then guide you through a range of simple self-diagnostic tests and medical options. Once the problem and course of care are determined, unique fitness ladders tell you what you can do to stay mobile and how to avoid further injury.